Home » high-definition , history , history channel , television , wwii in hd » WWII IN HD: Best high-def programming I've seen yet! WWII IN HD: Best high-def programming I've seen yet! My DVR just received a massive enema. Gone is stuff that I've recorded like P2 and Krull and Clash of the Titans and Stroker Ace (though how that got scheduled is beyond me, and I'm still trying to figure out how I wound up with Yentl). So now I've got plenty of disk space to record WWII in HD from the History Channel. HOW did I miss hearing about this until now? Well, no matter 'cuz History Channel is broadcasting them again and if you've got a high-definition television you really owe it to yourself to catch this, because you've never seen World War II as clear and brilliant as this before. See that still image? 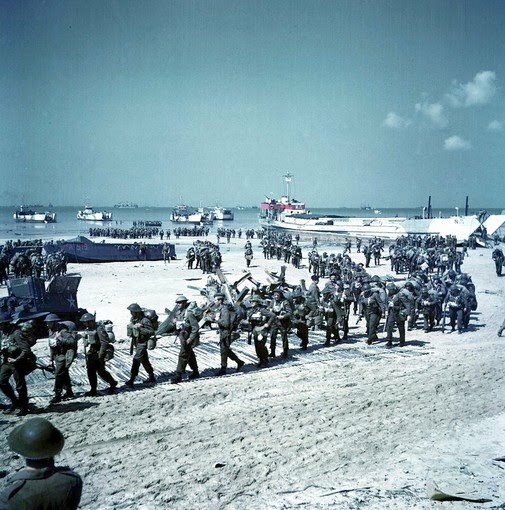 Those are British soldiers coming ashore at Normandy, and it looks so crisp and sharp you'd swear that this was footage gathered just yesterday. If History Channel puts this out on Blu-ray... well, between that and Star Trek that's prolly gonna be more than enough to pull me into adopting a Blu-ray player at last. But 'til then, watch WWII in HD however ya can! It's due out on Blu-Ray sometime in February.